Babies will love finding all 9 of the cheeky creatures that are hiding in this clever pull-the-tab book. Little ones will enjoy trying to figure out which animal they are about to find. Which animals can you spot on the farm? 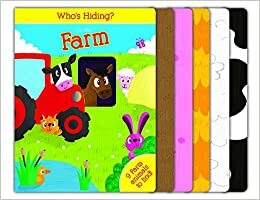 You’ll find lots of fun questions (and illustrated answers) that will teach your child to spot and name these wonderful creatures, including horses, cows, pigs, and others.